We have been making bespoke Wrought Iron Curtain Poles and Bay Window Curtain Poles since 1990. As such we have built up a wealth of expertise in providing highest quality metal curtain poles which we are therefore able to offer at very reasonable cost. We do tend to stay with simple, unique and classic styles which are in constant demand as these are timeless and look great in any situation. All our curtain poles are hand made to measure in rural Gloucestershire, exactly to the required length for a perfect fit. As a result, they will make any window dressing in your home look truly amazing. The poles are made from time-honoured slim, strong and elegant 16mm diameter solid bar or contemporary high quality 25mm diameter steel tubing. These metal curtain poles are made to last a lifetime. With a range of tasteful, simple finials and consequently will never look out of place. The poles are available in a Caramelised Beeswax, Traditional Black Metal or a polished steel Pewter finish to compliment any décor. Affordable quality for homes all around the UK (and elsewhere). Most of our business comes from customer recommendation and repeat orders rather than through professional branding and marketing. Over the years we have received hundreds of genuine, positive testimonials. Thousands of homes across the UK and Europe have had these wrought iron curtain poles and bay window poles chosen for them. This includes the homes some of the UK’s leading Interior Designers, Architects, Product Designers, Developers, Celebrities and Aristocracy. We have also been specified by The National Trust. S. P. Harrison has been trading on-line as a specialist in wrought iron curtain poles since 1999. Actually, one of the very first! Best quality curtain poles at sensible prices. The main range of curtain poles are individually hand made to order from substantial yet slim and elegant 16mm diameter solid iron bar with integral finials, pre-fitted with four double-hoop iron curtain rings per 30 cm. 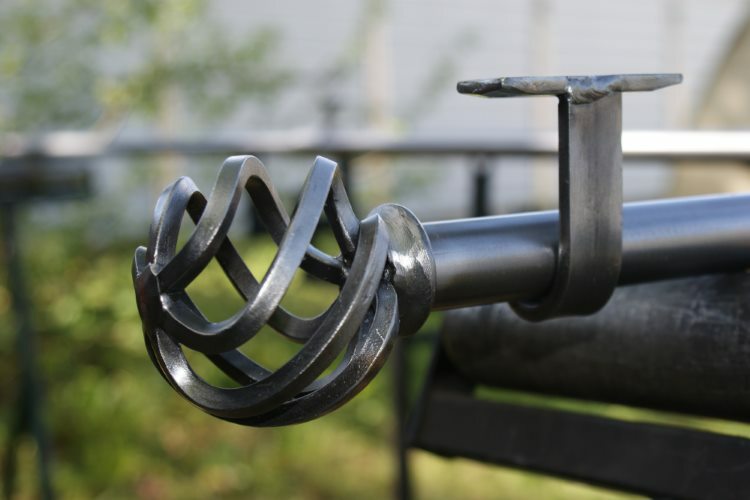 Solid bar is harder to work, heavier and so costs more to manufacture and deliver, but does gives a simple beauty and authentic character to a wrought iron curtain pole. 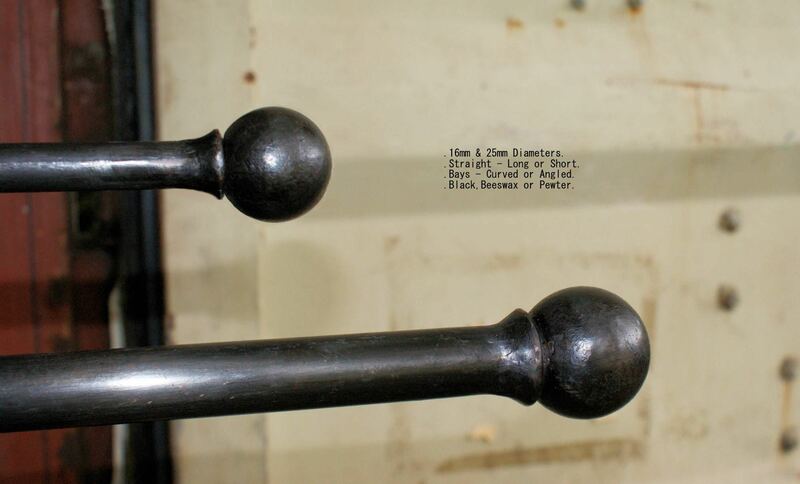 Although we have experimented with larger diameters we have found the slimmer 16mm has proven to be the most in demand as solid wrought iron bar can look crude in larger diameters as well as being excessively heavy for wall and ceiling fixings. Available in Beeswax, Traditional Black or Pewter finish. If you do prefer larger diameter metal curtain poles, we also offer poles made from 25mm diameter, thick wall steel tubing. These have the same finish options as the wrought iron range although, as yet, in a more limited range of finials. These are supplied with three rings per 30cm. Bay window curtain poles, both curved and angled, are also available in 25mm diameter. Click on any image below to open a window for prices. Shown with a Beeswax finish. Extremely popular simple, rustic design. 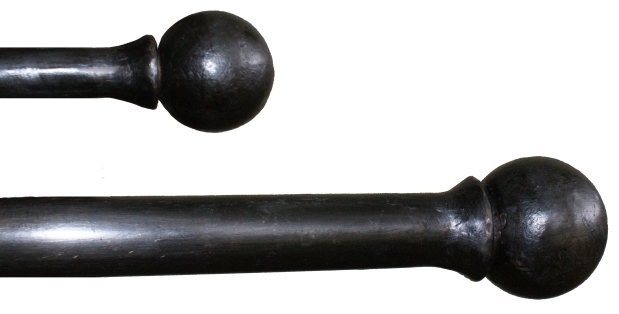 Best selling classic design for curtain poles and bay window poles. Suits both contemporary and traditional décor. 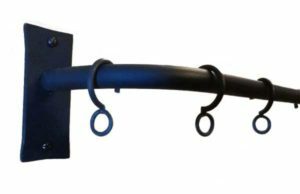 This complete bespoke wrought iron curtain pole only £52 for any length up to 150cm overall including finials, brackets, and 4 iron double hoop rings per 30cm of working pole length. Choose Black or Beeswax finish. 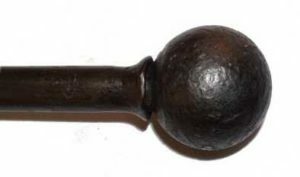 Finial length: 50 mm (approx). Shown with aTraditional Black finish. Shown with a Pewter finish. 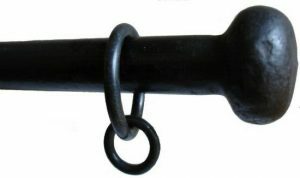 Finial length: 80 mm (approx). Nice alternative to other cage designs. For a minimalist look and a solution where space is limited. Finial Length approx 110 mm. Better in Beeswax or Pewter. Length of returns (inside distance between pole and wall) can be specified from 100mm to 150mm. The fixing plates’ dimensions are 100 x 40 mm (approx). The pole returns sit in the centre of the bracket plates which gives 20mm from the edges of bracket plate to pole and screw hole centres. Bay window curtain poles are our speciality. We’ve made hundreds (maybe thousands) of superb quality, bespoke wrought iron bay window curtain poles for both angled and curved (bow) bay windows. As a result we have a wealth of experience, technical expertise and resources to make these using measurements supplied by the customer. 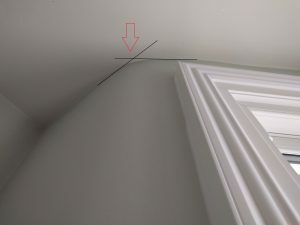 Never bent to a drawing chalked on the workshop floor, these custom made bay window curtain poles are properly designed and validated using AutoCAD. This way an exact fit is assured that runs level and parallel to the walls of the bay. The result is a quality, well engineered, beautiful bay window curtain pole. One that works as it should at the best possible price. If anyone can do it, we can! We can make bay poles from either solid bar or tube, simple and complex, multi-angled, curved or combination. If you supply mm accurate measurements, we can supply a pole to fit within mm accuracy of those measurements. We can even put a uniform, non contrasting, caramelised beeswax finish on tube too. As fully qualified Mechanical and Manufacturing Engineers, not just Blacksmiths or Farriers, we know what we’re doing. It’s basically down to efficient manufacturing techniques. 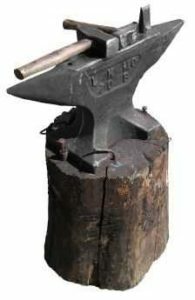 Whilst still hand-made, and we do use the hammer and anvil where necessary, we don’t pretend to be using out-dated, purely 17th century methods which would add absolutely nothing but huge cost and inaccuracy to the poles. Every manufacturer that makes wrought iron bay curtain poles uses MIG or ARC welders in the process, as we do. We make things properly, carefully and efficiently with the benefit of years of production experience and are honest about our methods. Also, we don’t spend a fortune (in fact, nothing!) on professional branding and marketing so there’s none of those overheads to recover. Please do compare our prices and quality. 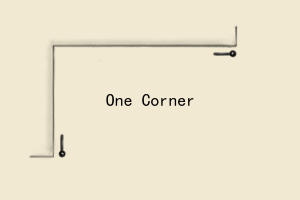 The pole should keep the same offset around the bay and the distance from the walls should not vary. 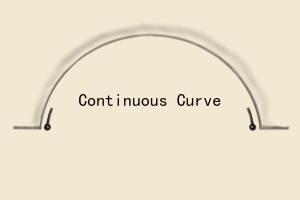 Variations in offset can be especially apparent in badly made curved bay curtain poles. A bay window curtain pole should be flat without twisting out of plane between bends or along a curve. Passing rings should not catch on the brackets or jump off the curtain pole, a common complaint of poorly designed poles. 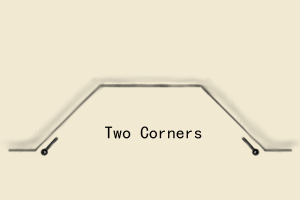 The curtain pole should be properly supported and not sag at the corners . It should be stable and not twist when the curtains are moved along it. The bracket fixing plates should align properly. 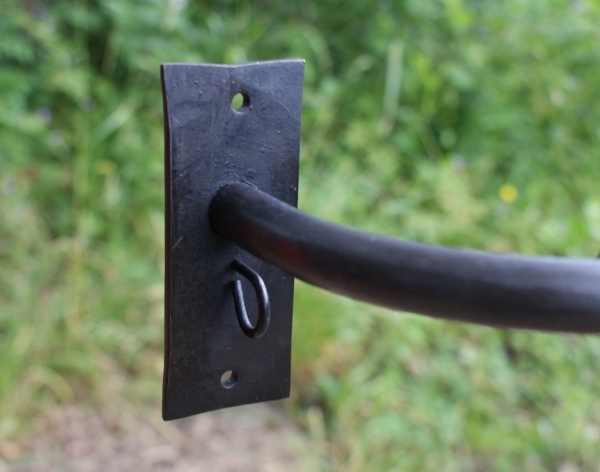 The pole should fit perfectly without the subsequent need for various modified brackets to be despatched. And last but not least…No ridiculous price tag! 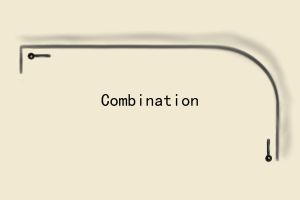 The curtain heading tape usually has three rows of pockets and strings. With curtain tracks, the hooks are inserted into the bottom or middle row of pockets so that the curtain heading hides the track. However, for curtain poles the hooks should be inserted into the top row of pockets so that the curtain hangs below the pole. This is especially important when using Passing rings. 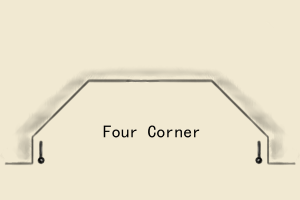 Passing rings should be attached to the curtain hooks inserted in the top pockets of the curtain header tape so that the curtain hangs below the rings. 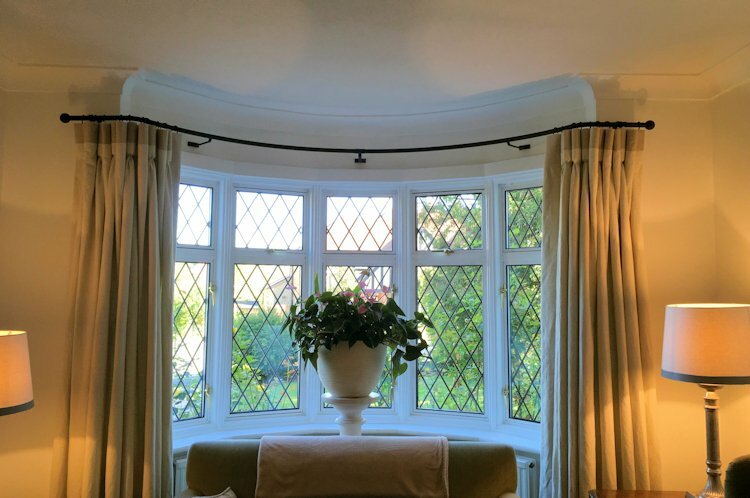 A bay window curtain pole formed from 16mm solid iron bar would usually use a five bracket passing ring system which ensures proper support so that the pole does not sag at the corners. 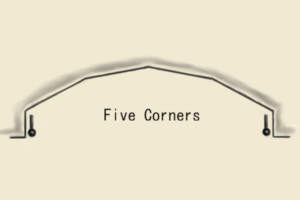 Whilst being strong enough for any size bay, these allow closer bends and result in a better, more elegant fit than can sometimes be achieved with larger diameters, especially for more complex bays. The refined look of the 16mm diameter poles is in constant demand and remains ever popular. 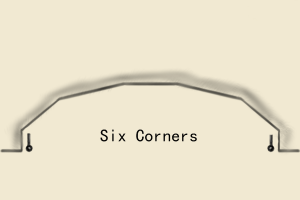 Multiple bends – no problem! We can even make Bay window poles with French returns. If you’re looking for larger curtain poles we can also make 25 mm bay curtain poles for both Angled and Curved bays. 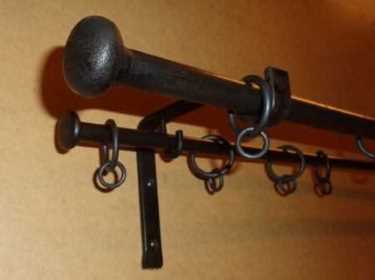 These are made from high quality thick wall tubing ( thicker quality than The Bradley Collection steel curtain poles). Steel tubing is used as anything in solid bar above 16mm diameter could put excessive strain on wall and ceiling fixings due to the weight, and the heavier the pole, the more it will sag under it’s own weight. The 25mm poles are available in the same finishes as the 16mm range. 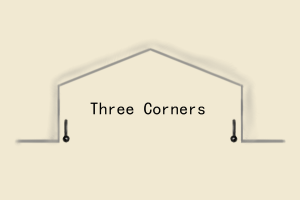 These are very strong and rigid poles which can span a greater distance than solid bar without extra support, so are often more suitable for ringless curtains too. 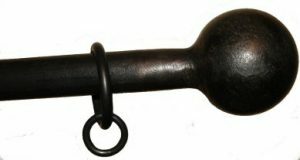 25mm diameter Curved curtain pole with Ball & Collar finials. If you need any advice we’re very happy to discuss. Either email us here or just give us a call on 01386 700299. 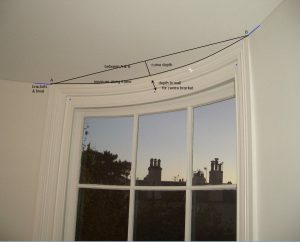 Scroll down and click on the appropriate drawing to select your bay window shape and follow the instructions for the required measurements. There’s a calculator which will give you a very good idea of the cost too. Remember, these are just examples of the more common designs but we can make poles for just about any shape of bay with any number of bends. We can also make curtain poles for ceiling fix too. Let us know if you have any particular requirements and we can let you know what measurements to take. Please note: The 16mm bay window curtain poles have five brackets making them suitable for use with a single pair of curtains using passing rings. This design would not be suitable for a single pair of Tab-Top or Eyelet curtains as they could not cross the intermediate passing brackets. Ask for our solutions for using TabTops and Eyelet curtains with your bay window. Of course! If you’ve provided accurate wall measurements and all relevant information, it’s no more than your entitlement that the pole fits properly.